On Scene: On Location: The Fulfillment Department. On Location: The Fulfillment Department. Every department here at TheFireStore plays a role in making this company a success. The Fulfillment Department is no different. Without this valuable piece to our company, how would we be able to get the goods to your doorstep, after all? We thought it would be fun to show you some behind the scenes photos here in our 27,000 sq. ft warehouse, that hustles and bustles with anywhere from 20-25 Employees, 2 Supervisors, and 1 Manager to make sure that your orders are being packaged with care. But first, how about some fun facts? Yearly, our Fulfillment Department sends out 188,000 packages. However, comprised within those 188,000 packages they're sending out over 488,000 items per year. If you lined up all the packages we send yearly, it would extend 3,008,000 inches, or 264,000 feet (50! Miles!) from end to end. Basically, they would extend the length of a professional football field 733 times. Wow. That's a lot of packages! Now, here is where all that hard work takes place. 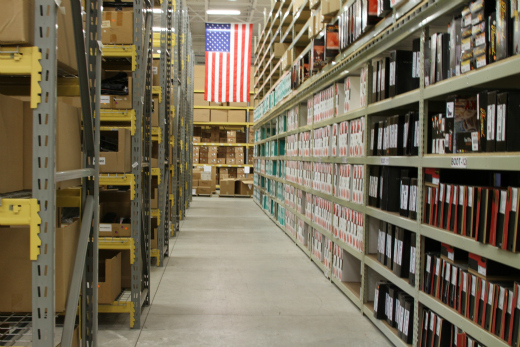 We hope you enjoyed a little behind the scenes peek into such an integral part of our business here at TheFireStore.